When westbound Sunset Boulevard is backed up, cars are routed off that street by WAZE and taken through the Alphabet Streets via Albright, ending up at that corner before turning left and going a block to go back on Sunset. Before the new stop signs, it was hard to pull out on Via, with parked cars blocking the view in both directions. And people trying to cross at that intersection often had to dodge cars. Now there are three Stop signs: north and south on Via and also on westbound Albright. The crosswalk is on Albright. A big thank you to Lou Kamer for spotting a problem and working with the City to take care of it. Three stop signs have been installed at Via de la Paz and Albright Street. About a year ago, when Altour travel agency left the pink Business Block Building (bounded by Antioch, Swarthmore and Sunset) it was rumored that the large space would become an all-services day spa. Topa Property Group has always been extremely efficient in renting its properties, so why is the Altour space still empty? New Tenants for Norris Hardware? In yoga class at YMCA on Wednesday, a member of the class said that a Ralphs clerk had told her that the Norris Hardware space is about to be leased to two different retail stores. Easter baskets are available at Little Lamma on the green in Caruso’s mall. A Little Lamma shop has popped up on the Caruso green. The employees are assembling Easter baskets that contain candy and little toys through this Sunday, April 14. This concierge service also offers curated children’s gifts for baby showers, birthdays and holidays. Visit: littlelamma.com. 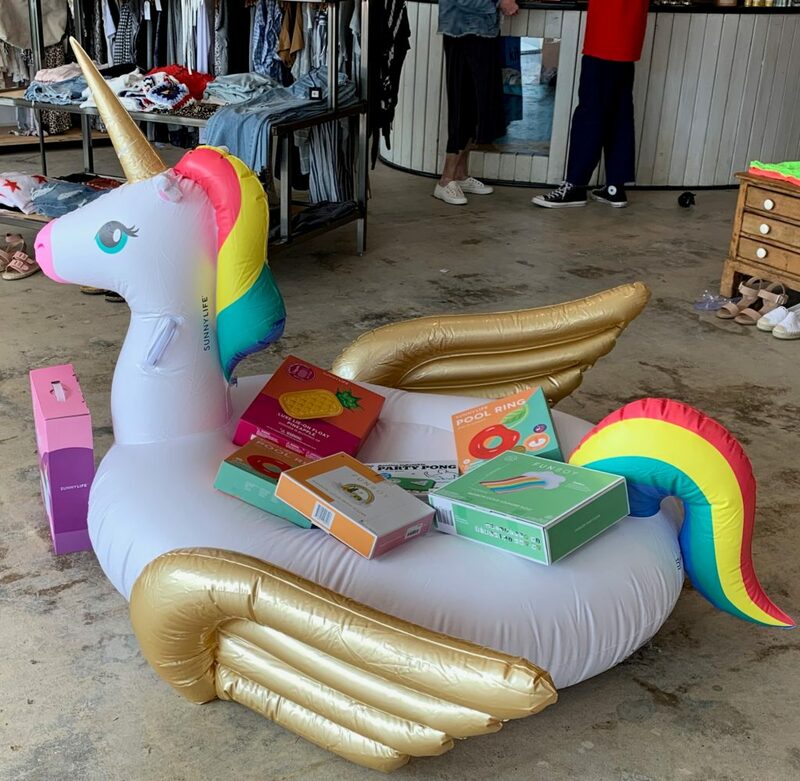 A inflatable pool unicorn is one of the many interesting items at the kitson pop-up. The kitson popup shop (visit: kitsonlosangeles.com) that is featured in a section of Paliskates,the clothing store on Swarthmore, has “fun” items, irreverent books, candles, home goods, comfortable sweats, tees and a variety of unique little gifts. Their father Krishan Chaudry arrived at Venice Beach in 1974 from India and introduced Indian prints and fabrics to Southern California. Five years later he opened a shop on Windward Avenue in Venice. RAGA was co-founded in 2012 by Chaudry and his sons, Sahill and Samir. The line, which means “melody of color” in Sanskrit, is created to represent the intersection of east and west, spiritual and material, ancient and contemporary. In 2018, a men’s line was introduced, and the collection pays tribute to its Indian and Venice beach roots. The fabric is soft and the prints unique. The fabrics, which come from the deserts of India’s Rajasthan, are washed with salt water near the beach. The hand-block techniques of the royal Rajasthani printers are used for the artwork. Installing a 3-Way Stop Sign at Via and Albright is another bad mistake. There is no justification for such an installation. There hasn’t been a reported accident at that intersection for as long as records are available which is 20 years. Via is the only street designated in the Traffic Circulation Plan as a Collector Street north of Sunset between Chatauqua and Rimmer. It is the main route for Alphabet Street and Hillside residents north of Albright to use as access to Temescal Canyon and Sunset. Stop signs should not be placed on intersecting residential streets unless traffic warrants exist which justify a stop sign. That does not exist here. Granted, it is uncomfortable at times for westbound drivers to enter Via because the view is obstructed by cars parked on the northeast corner of the intersection. The better solution is to red zone the curb on the east side for 50 feet instead of installing a greenhouse gas generating stop sign, which also puts more wer and tear on vehicles using Via. What happened is what usually happens when amateurs try to solve traffic problems. I admire you, and your research is sound. In this case, once they took away the two-way on Swarthmore, traffic circling has become a problem. I regularly walk my dogs in that area and with the changed traffic flow, it has become a real dicey at that intersection. Even taking the photo, cars were coming from all directions. Although Lou was credited by a resident for making it happen, I would bet a study validated the change. Make Swarthmore two-way again and you won’t have so many cars from the Alphabet Streets zooming down Via de la Paz or cutting across Albright. Another area to watch is at Sunset Boulevard and PCH. When I was at Vons, I looked up at all the condos lining the hills across the street. That intersection is already jammed during rush hours–where are all those extra cars going to go? 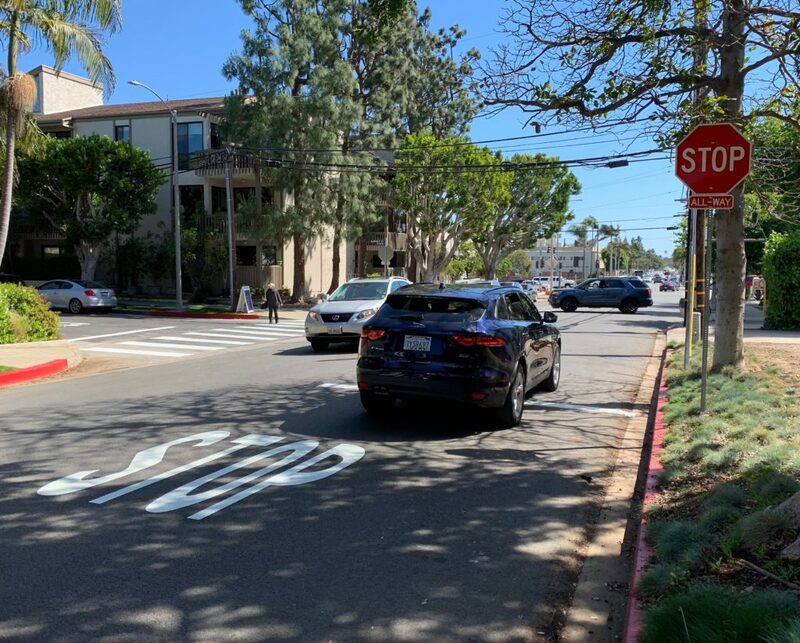 Let’s just hope that people will really STOP – S T O P at the new 3-way stop signs at Via and Albright!!! They certainly don’t stop at the Stop signs at Via/Antioch and especially at Antioch/Swarthmore–just breeze right on thru-no braking. At 2:00p to 3:00p if I’m still in town shopping I actually ask the Revere and Pali kids to “cross” me at those intersections! They always do-even give me their arm (if a guy). LOVE these kids!! But what example are parents giving kids once they start driving???? ?